The hunt for 2 cheap beaters. Euro edition. A colleague and a friend are both looking for a car. Their demands are quit different, but their budgets are somewhat similar. I wonder what kind of cars Oppo would suggest. Colleague. 30? Will get his first kid in a few months, needs just one car in his family. 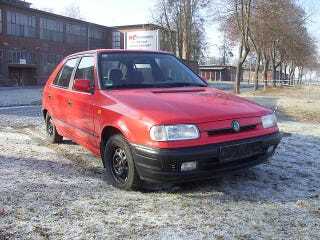 His current incredibly crappy Skoda Felicia (much crappier than the one pictured) will never meet the safety inspection it has to pass in 3 months, so it needs to be replaced. It's a bit small for baby stuff anyway. Budget: below €1000. This guy can wrench, and does like cars. When I told him about my Peugeot 406 coupe he became enthusiastic, and told me he sat in one in one of those international car shows in the late 90s. Friend. 23. She doesn't have her drivers license yet, but will need to drive a lot half a year from now. Longer distances mostly. Doesn't really care about cars and doesn't wrench. No kids, no kids planned. Budget: €1000-1500. Diesel is mandatory. Both people are Dutch. This means there's no need for AWD or ground clearance, what is needed is fuel economy. So, what kind of cars would you suggest?